On April 13, 1870, Governor Carlos Maria de la Torre issued a directive giving the necessary authorization to begin the leveling of the cathedral ruins and empowering the eccelesiastical governor, Mateo Yague y Mateos, in the absence of Archbishop Gregorio Meliton Martinez who was attending the Concilia Vaticano in Rome, to designate the Arquitecto de la Administracion Local, Don Luciano Oliver, to be the dor director of works for the cathedral reconstruction. Yague was also authorized to arbitrate for the necessary funds for the project, to send out circulars calling on those who would want to donate and to open a subscription from persons willing to support the monthly salaries of workers to be hired in the cleaning and clearing of the ruins and in the reconstruction phase. daily wages of the laborers employed in the reconstruction. In the morning of the following day, April 19, work on the leveling of the ruined cathedral commenced. Present to witness the first phase of the cathedral project were Governor de la Torre, Yague y Mateos, cathedral canons, the parish priest of San Pedro ( Makati ), Luciano Oliver, government officials, and other guests. For the proper disposal of the debris, Yague coordinated with the Cuerpo de Yngenieros which decided to dump the debris in the site of the fortification called El Pastel, of Santa Lucia, and in several points of the beach within the military zone of Manila. For such work, Yague requested for 30 carritones to be available on hand at the gates of Santa Lucia and Postigo to carry the rubble, and another additional 20 more at a site which the governor general pleased. Among the cathedral rubble were human remains and relics which were separated and turned over to the Archbishop’s palace upon Oliver’s discretion. Among such relics were the mortal remains of Simon de Anda, gallant hero during the British invasion and occupation of Manila. The clearing of debris and rubble lasted for 56 days at a total cost of 3,000 pesos. After this, Don Luciano Oliver presented his proposed plan for the cathedral. Oliver was chosen primarily because he was considered to be the best architect around, with his record of twenty-two years of designing and building structures in the colony, among which were the churches of Taal, Tayabas, Malolos, Navotas, Caloocan, and Malate, and other houses which he built to especially withstand earthquakes. On June 15, 1870, Governor de la Torre issued an ordinance creating the Junta Consultativa para los Restauraciones de las Yglesias or Consultative Committee for the Restoration of Churches. Formed specifically to restore Intramuros churches, the committee would assist in the restoration of the Manila Cathedral. The Junta had the governor general for its president, the dean of the cathedral for vice president, and the penitenciario, magistral, doctoral, a racionero, and a secretary as members. The Inspection General de Obras Publicas also proposed to the governor general the creation of a facultative commission, as ordered by the Royal Orders of August 10 and October 19, 1863, that will take charge of the reconstruction of buildings destroyed by the earthquake. It was composed of Luciano Oliver as head with two others as members. Its aim was to meet with the ecclesiastical governor and obtain from him the program of the cathedral regarding the necessary requirements for the new edifice; to assess and examine the cathedral and determine which areas needed to be demolished and preserved; and to propose the most scientific, artistic, and economical method of construction best suitable for the reconstruction. The committee fulfilled its objectives but Oliver was not able to make a proper project presentation for some reasons. Since the Inspeccion General de Obras Publicas could not give its stamp of approval without any formal project proposal, it proposed on March 8, 1871, to suspend all works on the cathedral. The suspension took effect on May 26, 1871 by virtue of Royal Order No. 396. On July 29, 1871, Governor General Rafael Izquierdo ordered for a reassessment of the works executed in the cathedral and to determine which could be completed, so that in a span of two months, the cathedral could be protected from the coming rainy season, until such time the formal project proposal could be approved and reconstruction work could commence again. However, Don Luciano Oliver could not continue to work on the project, and on October 3, 1871, he renounced his position as director. With the arrival from Rome of Archbishop Meliton Martinez, membership of the Junta or the cathedral restoration committee was modified by the Superior Decree of September 12, 1871. The new members would be composed of the entire Cabildo under the presidency of the archbishop. The Junta met to elect and assign a new architect for the project. On October 23, 1871, Don Vicente Serrano y Salaverri was named officially as the new director of the project. On April 20, 1872, Serrano presented the memoria y planos, proposal and plans, of the reconstruction project. In the said proposal, modifications were made in the buttresses and framework of the roof. The same, with some modification by the Junta Consultativa de Obras Publicas, was approved by virtue of the Royal Order of August 6, 1872. The following were the modifications in Serrano’s proposal. Instead of the iron columns specified by Serrano, columns of molave to be sheathed with iron would be used. The zocalos of granite stone would be replaced by zocalos of Meycauayan stone. All other specifications made by Serrano were approved. In May of 1873, the final plans for the project were elevated to the Minister of Overseas with favorable recommendation from the Junta de Obras Publicas. It was approved by the Spanish Academia de Nobles artes de San Fernando and ultimately by the Supreme Government on December 13, 1873 by virtue of the Supreme Order No. 1686. Construction of the new cathedral commenced immediately thereafter. Archbishop Pedro Payo worked with so much zeal and tireless activity for the cathedral so that he was able to obtain easily the necessary funds required to complete the structure. He even donated part of his own wealth to several works in the Manila Cathedral among which were the construction of the main altar, the image of the Immaculate Conception, the organ, and the reboque and painting of the bell tower. Failing health forced Serrano to resign from his job as director of the cathedral reconstruction, so that he was replaced on October 31, 1873 by Eduardo Lopez Navarro, who was chief engineer of roads, canals, and ports in the colony. Serrano died a short while after Navarro replaced him. Engineer Navarro continued to direct the work until April 10, 1878 when he had to leave for Spain to recover his health. Taking over from Navarro was Manuel Ramirez y Bazan, who was inspector general of public works, and who was assisted by Ramon Hermosa. Navarro and Ramirez did not change Serrano’s design. They retained the basic essence and architectural character of the cathedral as planned and envisioned by Serrano. The new Manila Cathedral was inaugurated during a two-day festivity with solemn rites. On December 7, 1879, the Manila Cathedral was blessed and consecrated by Archbishop Payo. He blessed the exterior and interior of the cathedral. Afterwards, the relics of two martyrs, San Victor and San Lorenzo, were brought to be kept in the cathedral’s Chapel of St. Peter. Then, the first mass to be celebrated in the new cathedral was officiated by the Bishop of Jaro. The following day, feast of the Immaculate Conception, titular patroness of the Archdiocese of Manila, saw the formal opening of the cathedral. Much revelry and merrymaking, with fireworks and music, accompanied the feastday and the cathedral’s inauguration, sixteen years after it was destroyed by the 1863 earthquake. The cathedral rose once again to become the city’s premier temple. The Revival Styles, which swept the circles of art and architecture in Europe, made its impact in the Manila Cathedral when Architect Serrano employed a style dentro del mismo estilo romano bizantino pero con mas gusto Oriental como satisfaccion a las exigencias de lugar -after the Romanesque-Byzantine style but with more oriental flavor satisfying the exigencies of the site. What evolved was an eclecticism combining and reviving the two styles, with much influence too from the Renaissance. The cathedral had the three main portals with receding arches and a giant rose window over it. In the main façade were large statues of the four evangelists, while sculptured figures of saints Peter and Paul graced the cornice above the main portal. Angels with a cross cap the cornice of the uppermost level of the cathedral’s main façade. Antefixae adorned the cornices while the roof ridge was ornamented with delicate wrought iron railing. A dome raised on a fenestrated drum marked the nave and transept crossing of the cathedral. Finials with pineapple motifs found their way as ornaments in the façade walls. The cathedral was cruciform in plan, with a central nave and two collateral ones. Arcaded colonnades separated the central nave from the other tow. It had a raised main altar, a semi-circular apse, and transept ends which follow the same semi-circular pattern. At the epistle side of the main altar was a rectangular room with a hemispherical ceiling assigned to be the Chapel of St. Peter. Two other large chapels, which belonged to the Parroquia de Intramuros or what had been the Parroquia del Sagrario were connected to the nave by the same ceiling. Although highly modified, these areas were parts of the old cathedral which had been preserved. The new plan of the cathedral did not deviate much from the plan of the previous one in terms of distribution of spaces. Major access ways to the cathedral were nine: three in the façade, one at each lateral side, one at each transept end, and two in the apse. Four minor entrances, which were those leading to the Chapel of St. Peter and the other auxiliary areas of the cathedral, made up a total of thirteen entrances to the structure. The interior of the cathedral was richly ornamented, with gildings, sculptures, and frescoes. The Italian artist Giovanni Dibella executed the paintings in the nave and dome. The study of the four evangelists painted in the dome were by the director of the Academia del Dibuhos, Señor Agustin Saez and executed by Dibella. The paintings in the chapels were done by native artists. Illuminating the nave were tall clerestory windows with their stained glass panes providing a rich and colorful luminosity in the cathedral. The side chapels were illuminated by large ojos de buey or ox-eye windows. The church had a spacious and raised nave, with the choir area located at the center of the nave. The nave columns and pilasters were tall and slender and raised on granite bases. The arches were majestic and highly ornamented. 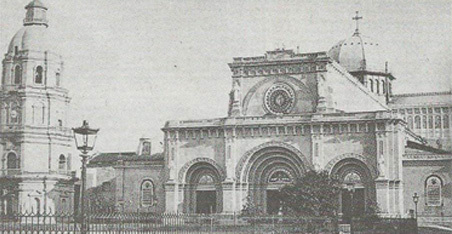 Its elevated dome was raised on an octagonal drum, each face of which had three tall windows. The choir had benches and a finely wrought railing. Six seats of honor under the baldachino were imported from Paris, while the rest of molave were sculpted by the famous Manila artist Isabelo Tampingco who also did some of the ornamental details in the church like the wooden capitals of the nave columns. The image of the Immaculate Conception, which was a copy of the Spanish painter Bartolome Esteban Murillo’s work, was executed in Manila by Señor Juan Sales, a Filipino. The main altar had a lovely marble table and was raised by a series of steps made from the same material. Both were the works of Rodoreda. The building materials used for the cathedral were varied. Granite was used for bases, walks, pavements, and steps. Meycauayan stone was used for the exterior walls while volcanic stones from Guadalupe were utilized for the interiors. Bricks were used for the upper level of the main façade and for the arches. Iron was used for wrought and consolidation works. Galvanized iron found their way in the roofs over the nave and apse. Red copper plates covered the dome. Gutters were of lead and ornamental crests were of zinc. Mortar used for the building was reinforced with Portland cement. Native hardwood, like molave, were also used for structural framework. The Manila Cathedral was witness to the movement to Filipinize parishes and to the tragic aftermath of its persecution. The issue of secularization in the Philippines had long been a source of conflict among the religious regulars and church seculars. 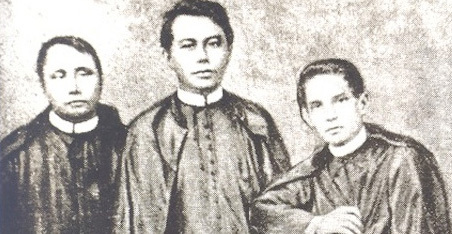 Among those who advocated strongly for the rights of the secular clergy were Fathers Pedro Pelaez of the Manila Cathedral and Mariano Gomez of Cavite. A few years later, on January 20, 1872, a mutiny broke out at the Cavite Arsenal over the unreasonable deductions in the salaries of the arsenal workers due to Gov. Gen. Izquierdo’s new tax imposition. Sympathizers for the workers mutineed that night causing the death of Sgt. La Madrid, the mutiny leader, and the fort commander whose wife was also injured. The Spanish authorities used this incident as an excuse to implicate those who were advocating religious reforms by connecting them to a separatist conspiracy. Thus, the government arrested Fr. Gomez, along with the outspoken advocate of secularization, Fr. Jose Burgos, a young doctor of canon law, and Fr. Jacinto Zamora. They were healed to a one-sided trial and publicly executed by mechanical strangulation at Bagumbayan on February 17, 1872. Archbishop Meliton Martinez privately sympathized with the struggle of the Filipino clergy. Although he threatened the three priests with excommunication in his pastoral letter, he refused to defrock them as requested by the governor general. Instead he even ordered the tolling of the bells of the churches of manila as a funeral dirge for the three martyr priests whom he saw as mere scapegoats against the rising tide of Filipino nationalism. In keeping with the treatment of the enemies of the state, the corpses of the three Filipino priests were clandestinely taken to the Paco cemetery and were dumped in a common unmarked grave. In 1880, the cathedral fell victim again to another earthquake. Its bell tower which survived the 1863 earthquake crumbled to the ground and a makeshift one of wood replaced it. the dome underwent repairs after this incident. However, the cathedral would remain without a bell tower for many eyras, in spite of plans and proposals to have it restored, until its merciless destruction by war in the middle of the twentieth century. The closing of the nineteenth century were turbulent ones, not only for the Church but also for the entire colony. The Philippine Revolution of 1896 and the Filipino-American War, 1898-1902, saw the transition of colonial power from Spain to the United States. During these periods, Archbishop Bernardino Nozaleda opened the cathedral doors to the Spanish soldiers who sought refuge from the enemy and to the invading American troops who converted it in 1898 into a hospital for wounded American soldiers. The Catholic Church would experience trials again with the shift in colonial power. The Cathedral of Manila witnessed the transfer of leadership of the archdiocese to the American secular clergy. Despite the strong foothold that Protestantism and the Aglipayan Church gained during the early years of the twentieth century, the Catholic Church would remain steadfast and strong as the Archdiocese of Manila had been. As the twentieth century unfolded, a whole new ear dawned for the Archdiocese and Cathedral of Manila. The few years of this century saw the last Spanish prelate of Manila Archbishop Bernardino Nozaleda holding on to the reins of the Catholic hierarchy. Associated with the told and detested system of frailocracy in Spanish colonial Philippines, Nozaleda easily earned the reputation as one of the most unpopular archbishops in the history of the colony. The Philippine Revolution marked the reversal of fortune for Spain and the religious who were portrayed and considered by not only a few as the villain in the colony’s history of servitude, abuse, and oppression. During this period the secular clergy gained possession of the parishes which were once the domain of the regulars. It was the time when the delicate issue of friar lands became a ground for debate. It witnessed the rift and final schism between Gregorio Aglipay, a secular priest and vicar-general in the Philippine revolutionary army of Emilio Aguinaldo, and the Catholic Church. The Union Obrero Democratica of Isabelo de los Reyes, a famous propagandist and labor leader, proclaimed the creation of the Iglesia Filipina Independiente in August of 1902 when their clamor to oust all the Spanish friars from the country and their desire to organize a new nationalist and patriotic Church composed of Filipinos, but still under the authority of the Pope, were denied by the Vatican. Aglipay accepted the leadership of the newly created Church as Obispo maximo. Catholic morale was at its lowest when the tide of Protestantism unrestrictedly washed through and seeped through the colony with the coming of the Americans, as part of their concepts of Manifest Destiny and Benevolent Assimilation. With the end of Nozaleda’s term as prelate of the See of Manila in 1903, the American secular Jeremias Harty took over the administration of the Manila archdiocese’s Catholic faithful, signifying an end to Spanish dominion in the Catholic Church. Harty successfully consolidated and strengthened the church during these troubled years. He was responsible for convoking the Second Synod of Manila in 1911 which summarized and tabulated past Episcopal decrees and statues. He was succeeded by Michael J. O’Doherty in 1916. Archbishop O’Doherty contributed in freeing the Archdiocese of Manila and the whole nation from 300 years of Spanish Catholic conservatism and in supporting the rise in leadership of the secular clergy under the Americans and the emerging Filipino leaders like Manuel L. Quezon. In 1925, he convoked the Third Synod of Manila which brought archdiocesan legislation in line with canon law. He strengthened and improved the facilities of the Seminary of San Carlos, introduced the use of English in Catholic schools, supported the establishment of welfare groups, like the Welfareville Boys’ and Girls’ Towns in Mandaluyong, and issued Catholic publications – all well-meaning efforts to make the Catholic Church closer to the people and attune it with the times. In time, the Catholic Church gained strong roots again, weathering the criticisms hurled against it by American Protestant proselytizers, still retaining its position as the dominant religion in the islands. The Manila Cathedral underwent minor repairs and alterations during the first decades of the twentieth century prior to its cruel destruction during the Battle of Liberation in 1945. Although in 1915, Archbishop Jeremias Harty made slight repairs to bring back the cathedral to its former glory before the Philippine Revolution and the Filipino-American War, Serrano’s design was not changed. Thus, the 1879 cathedral survived until the Second World War, with its basic forms and features preserved and only slightly altered. In the Manila Cathedral were held important religious ceremonies to celebrate the coronation of the Popes and their demise. In 1907, a significant celebration was held to commemorate the Golden Jubilee of the Proclamation of the Dogma of the Immaculate Conception, an important event for the cathedral under whose titular patronage it was. Special rites were also performed in the cathedral to observe the First national Eucharistic congress held on December 11-15, 1929 and the 33 rd International Eucharistic Congress held on February 3-7, 1937. The cathedral also witnessed the Te Deum for the safe arrival of Calvo and Arnaiz, the first Spanish aviators who flew from Spain to Manila. A solemn Te Deum and a special mass to mark the occasion of the inauguration of the Philippine Commonweath in 1935 were held in the Manila Cathedral. During the period before World War II, the Cathedral was described to be a lovely church replete with ornaments, furniture, statues, and images of remarkable antiquity and beauty. It had several chapels dedicated to St. Joseph, Our Lady of Sorrows, St. Peter, Sacred Heart, Our Lady of Mercy, St. John Nepomuceno, and Our Lady of Guidance. This latter chapel was also known as the Parroquia del Sagrario, the chapel which served as the parish church of Intramuros and home of the image of Nuestra Señora de Guia before her transfer to Ermita Church. The Cathedral also sheltered the Virgin of Antipolo in 1647, for a period of time, some years after the church was sacked and burned down during the Chinese revolt in 1639, until her eventual installation again in Antipolo Church. It was in the Chapel of Our Lady of Sorrows that the offices for the dead were sometimes performed and where, in a niche, the remains of Msgr. Giovanni Battista Guidi, apostolic delegate during the American Occupation, were interred. In the sacristy were hung old paintings of the different archbishops of Manila. In there were kept rich vestments and old wooden chests, consoles, and bureaus. Enormous choir books of great antiquity could be found among the reliquaries and wardrobes in the sacristy. Among the exquisite paintings in the cathedral were those of The Baptism of Our Lord, St. Anthony of Padua, and The Crucifixion. The main altar was graced by the statue of the Immaculate Conception, after Murillo’s painting, with the ceiling above it painted to simulate the sky dotted with many faces of cherubs. Surrounding this high altar, in a frieze-like band were the heads of the apostles. While in the transept areas were the kings, prophets, and patriarchs. The clustered columns in the nave had beautifully gilded capitals. The dome, which had an anterior balcony, was raised on a drum, with pendentives, painted with frescoes of the four evangelists: Matthew, Mark, Luke, and John. At the back of the main altar were interred the remains of Simon de Anda, while behind it in a mausoleum were those of Archbishops Jose Aranguren and Jose Segui. From its humble conception as a small parish church, the Manila Cathedral grew and metamorphosed to be a significant force in the affairs of the archdiocese and the Church. Its history shows that it has been a survivor of time and nature’s devastations, and the labor of love of its different archbishops and the countless faithful of the archdiocese. After World War II and its destruction, the Cathedral would rise again, as it has always done in its colorful past, stronger and better, a shining torch of the Faith, not only of the archdiocese of the whole Filipino nation.